Face book has always been my boon companion for I always sort out the things in positiveness. In addition to, it also makes me cheerful for I get to contact with friends and cement new friends. Few days ago I came across this picture (from Laughing Color Page) being shared by some of my friends as given below. After all, the main purpose of this picture is for laughing. It reminds me of my school days when we had to compulsorily be the follower of this bittersweet bell. Before morning we never want to hear it but after noon we yearn for it. It can be just compared to our own life holding both the rings of joyfulness and joylessness. Fair dinkum, it depends upon the perception we drink about life, because we cannot change the situation but we can certainly change our perspective as quoth by Jimmy Dean; "I cannot change the direction of the wind, but I can adjust my sails to always reach my destination." If life rings either happy bell or sad bell, we are responsible for how we receive it and accept it. 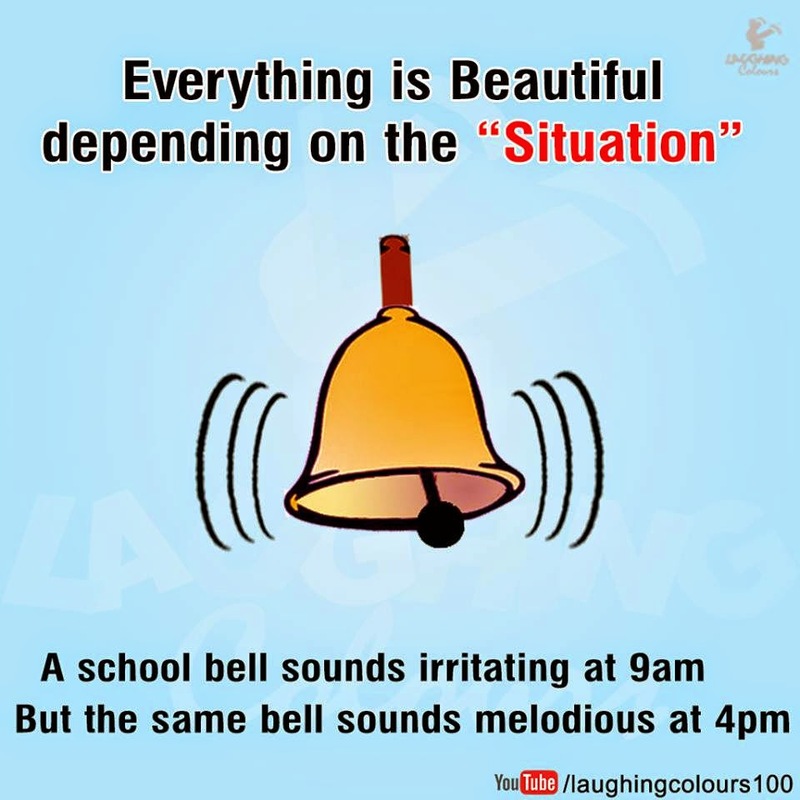 In otherness, the above case maybe reversed for some of an enthusiast school-goers, they will feel melodious at 9 am but really irritating at 4 pm, this applies to only negligible of us but majority of us will appreciate the fact of above. From here we can surely conclude that situation is after all a situation only we can do nothing of it and the considerable thing is we must change to adapt the situation and the truth is we have the ability to do it but many of us leave this pages unnoticed. Everything is beautiful depending upon the situation we experience and how we perceive it, we cannot blame the position instead we must blame ourselves if the things do not turn the we want because we are the driver of our own life. The path maybe rough and tough but it depends upon how we drive it, either carefully or carelessly and that will determine what we really deserve. P.S. Will come up with powerful thoughts regarding this in coming post.